I measured the gap on my Bach 43 with 25LR leadpipe, and a number of mouthpieces (7 of them). Results were all around 10 mm (.394 inches), down to 8.5 mm (.335 inches) with my 1½C. Isn't that weirdly large? Could it be because of the reversed leadpipe construction? I haven't felt any problem, but it's the only trumpet I've played for 15 years, so I don't really know if I'm missing out. fundamentally, the reversed leadpipe wouldn't affect the gap, other than in fine-tuning you may find a different gap works better. News Flash! New replacement mouthpiece receivers from Bach are NOT final reamed resulting in an excessive gap. Much like brand new unhemmed trousers, the final step has not been completed. Fortunately we have a CNC program on one of our lathes that single point bores the taper of Bach receivers to Vincent Bach's "pocket" (gap) of 1/8". My guess is the repair person that installed the new receiver was unaware of this. One exception to the 1/8" (.125") rule are Bach Chicago and Philly model C trumpets. These have a different part number from the Stadivarius mouthpiece receiver found on all other models. I've seen as much as 3/16" (.1875"), which is intentional. For a little less narrow focus I've reduced Chicago and Philly trumpets to 5/32" (.15625") gap making them play broader and less stiff. Being a bit greater than 1/8" gap still maintains firmer articulations these models are known for. I first measure the distance between the end of the receiver and the end of the leadpipe, with a small wooden rod. I feel the edge of the leadpipe with the rod and mark where the receiver ends on the rod. Then I put a mouthpiece in the receiver, mark where the end of the receiver meets the mouthpiece shank, then measure from the mark to the end of the shank. The first measurement minus the second one gives me the gap. It's my Connstellation that got a receiver replacement! The Bach has everything from factory, I suppose. I bought it new in 2003. Do you think a new trumpet at the time still should require this final step? I just made new measurements with the same set of 7 mouthpieces, on my old Bach 239. All with gap around 2 mm (.078"). Just to say that I don't think it's my measurement method. I don't know what to do, I really would like for me and my 43 to reach full potential! Get sleeved mouthpieces or take it to a tech and have the receiver adjusted. Sleeved mouthpieces cost a little but will not permanently change or damage your horn. They also allow you to find the optimal gap without soldering. Just curious, on your Bach 43,what is the length of the portion of the mouthpiece shank that inserts in the receiver? And what is the length from the end of the receiver to the leadpipe edge? The mouthpieces actually go deeper in on the 43 than on the two others, with the receiver edge as a reference. Insertion of about 28 to 30 mm (1.14") for the Bach 43. The Connstellation has insertion about 23 mm (. 906"), and the 239 of about 25 mm (.984"). So yeah... The 43 seems off. By half an inch. Any chance this would be by design? I mean, I do play this trumpet. I know all the "if it ain't broke", but what if? As for sleeves: could they really make up for such big offset? Good question. I would suggest contacting someone like Bob Reeves or Mike Thompson at Thompson Music. I purchased mine after consulting with Mike. I have a pretty good idea of what happened with your LR180-43. We've seen this before where someone inserts a #1 Morse reamer and cuts into the pipe resulting in an excessively deep shoulder. If you shine a bright LED penlight down the receiver you'll see what I mean. The measurements from your C180-239 are more the norm for depth, however the gap indicates wear. When a gap measures -.030" below the original .125" with a Bach mouthpiece, I like to restore it to stock with a new replacement receiver. Until you have control of the gap by having the ability to shorten or lengthen it, you'll never know where the right gap is, in terms of performance, intonation, etc. A mouthpiece you like, but isn't your best 'piece, is a good subject for experimentation. Mr. Becker can sleeve it. In many instances I'd agree with converting their mouthpiece to Reeves Sleeves, but I'm afraid someone has gone too far and destroyed this 25LR pipe. Starting fresh with a brand new 25LR pipe mght be the best solution. Otherwise we can convert a shank for sleeves while you wait, or ship it in and we'll turn it around in a day. We stock the entire range including 1/4 sizes. Can the sleeves compensate for a gap this large? From ~.394 to ~.125? Why would people do that? To accommodate for a mouthpiece that hits the leadpipe? The horn was supposed to be new, but I guess it's not impossible that the shop did something to it first. The measurements from your C180-239 are more the norm for depth, however the gap indicates wear. That's interesting! Wear as in, the receiver became wider after years of having a mouthpiece in and out, and now the mouthpieces reach deeper in? If you shine a bright LED penlight down the receiver you'll see what I mean. 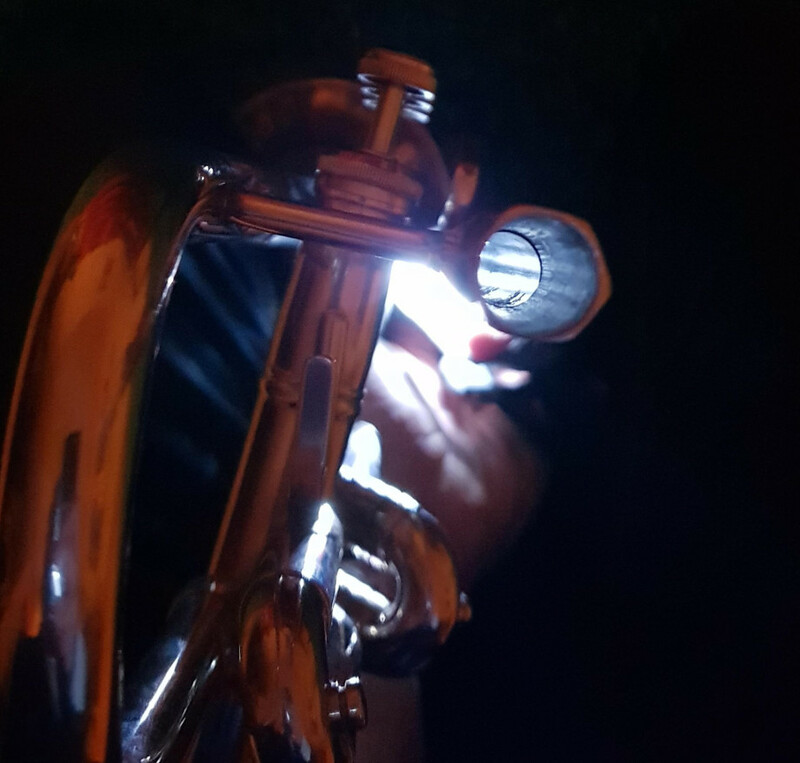 So I've done that on all three horns, and attempted to take pictures, see here. The edge of the leadpipe aren't as visible on the 43 as on the other horns, it almost looks like someone attempted to remove the edge, to smooth out that shoulder. I can see why someone would think this would be a good idea, to remove some resistance and get a more free-blowing horn. The thought seems good at least, but I suppose you knowledgeable people here would say it's a bad idea? Could it be something that people did 15 years ago? I read about gapless leadpipe? Thank you dontiego for the images, this confirms what I suspected. I can actually see the chatter marks left behind from the reamer flutes. This is an example of a well meaning individual doing something without knowing any better. FWIW I have a copy of a drawing by Vincent Bach of his mouthpiece receiver with a mouthpiece inserted. In this illustration Bach labels what we call a gap as a "pocket" at 1/8". Many have explored variations on this relationship to great advantage and personal preference. However at the end of the day the "pocket" Vincent Bach describes is the middle ground where a balance is achieved across the registers. My preference is to set a replacement Bach receiver at neutral 1/8" with a Bach mouthpiece. Should you choose a different make of mouthpiece it will result in a gap as that maker intended. Should you desire a brand new 25LR pipe expertly installed we can help, just contact our shop at sales@osmun.com of phone 978-823-0580 and we'll fix you right up. And at the same time we'd be happy to convert your mouthpiece for Reeves sleeves so you can explore gap to your heart's content. James, I really appreciate the help, that's great! What baffles me is that a shop could sell me that horn as new, while this happened. It was long ago, maybe I don't remember correctly and they meant *nearly* new. Do you have any comment on "gapless leadpipe"? Don't you think that's what they tried to achieved? If I were in the US I'd definitely try to book you to work on the horn, or at least look at it. Shipping from and back to Europe isn't really an alternative though. I'll try and see if my local shop have a mint 25LR, and test it beside the one I have. Speaking of which, I've seen people test a leadpipe on the side of their installed one, just taped for testing. But isn't the leadpipe going to behave dramatically differently once it's soldered I stead of taped? There are a few oddball things with your horns, and James has addressed your Bach weirdness .... but you 38b has a “replacement receiver”? The 38b does not even have a receiver. It’s all one piece of electroplated copper over two mandrels one fro the receiver end taper and the other is the main leadpipe mandrel. The two are screwed together and then electroplated until it’s really thick and then the thick walled result is turned down thinner on the big end and also turned down where the “receiver” would normally be, to make it look like two pieces. If yours has a “replacement receiver” it’s means that someone sawed the old one off and added one. I suppose it’s possible, but def weird. 38b receivers are amazingly consistent (not that amazing considering the electro-form process) and they all have (all I’ve checked, which is is only about maybe 25...but that is fairly a lot) have a gap of .110 with a .385 (Bach) mouthpiece. All in all, you have some unusual happenings in your horn collection.. It isn't the same as soldering but it does let you compare. I have made adapters that solder to the new pipe with a mouthpice shank that you plug into the old pipe. You can play wit your normal pressure without the pipe sliding away from you. LOL Zip ties work too. What country are you in? If you don't have a good repairperson some of our international members might have a suggeston. PS IF you want to go more open and bright try a 43 pipe.